MELBOURNE has given a second chance to Brisbane Lions Academy reject Oskar Baker after the speedy midfielder fought back to enjoy a breakthrough season in the NEAFL this year. Baker was cut from the Lions Academy program at the end of 2015, but the Demons took the 19-year-old line-breaking midfielder with their final pick in Friday night's NAB AFL Draft, at No.48 overall. Melbourne recruiting manager Jason Taylor said the club had been tracking the Queenslander since early this year and was convinced to take him by his steady improvement with NEAFL team Aspley. "He's grown quite significantly in the last two years. He's just a really natural player who takes the game on. He's a risk-taker with the ball in hand, but he's got good speed and he's a very good decision-maker and he adds a bit of class too," Taylor said. "I think along with Charlie Spargo, that type of player, Oscar was a need for us. "He just grew a bit and then he got an opportunity at Aspley in round five where he debuted and by the end of the year he was playing pretty good footy at that level and he's got AFL attributes – speed and class. "He's got certain areas of his game that he needs to improve, but we feel that he's got the right attitude and that he'll be able to do that. He's shown the resilience." Charlie Spargo, the son of former North Melbourne midfielder Paul, was the Demons' first selection, at No.29. Taylor said the 172cm small forward/midfielder would most likely start his career with Melbourne in attack, where his ability to hit the scoreboard and his deceptive strength overhead would add some potency. But Taylor thought in time Spargo's ability to cover the ground would mean he was a more natural fit in the midfield. 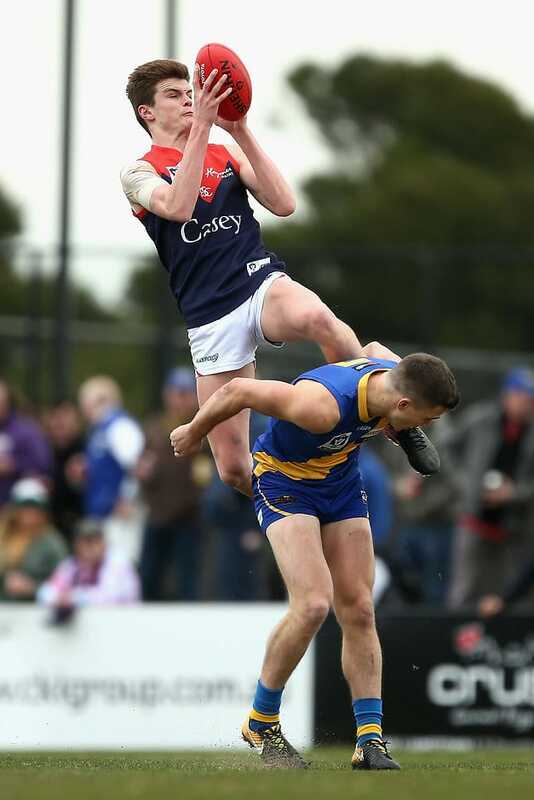 Melbourne used the draft pick it received for Jack Watts on Bayley Fristch from its VFL affiliate Casey after the 20-year-old forward stamped himself as one of the most exciting mature-age prospects this season. Melbourne selected Fritsch with the pick No.31 it received from Port Adelaide in the Watts trade, having watched from close quarters as the talented forward won the 2017 Fothergill-Round Medal as the VFL's most promising player and finished runner-up in Casey's best and fairest award behind Jack Trengove. Fritsch, 186cm and 82kg, finished fifth on the VFL goalkicking list this season with 42 goals from 19 games, having overcome a back fracture that ruined his 2015 season and a knee injury that troubled him last year. "We were really excited to get Bayley, not only for the strength of our alignment but because he's a really talented young player," Taylor said. "He's a very good reader of the ball in the air, so he's exceptional overhead for a medium forward. He's quite classy with the ball in his hand, especially in front of goal." Melbourne took South Australian key defender Harrison Petty with its other selection at pick No.37. Taylor said key defenders were hard to come by and Petty, 195cm and 82kg, looked a promising long-term prospect. "We think in time he can become a player who can play in our best defence," Taylor said. "He's a good reader of the ball in the air and he's a competitive player and he plays with a lot of composure. "His bodywork is pretty good for a young kid. We feel he's got a lot of improvement."